3 Day per week training routines are excellent for beginners and intermediate bodybuilders to pack on muscle mass. They target biggest muscle groups, allow perfect recovery and hence result in best muscle gains. The professional bodybuilders might make you believe that only 6 day per week blood and sweat drenching workouts work. But they are wrong. I will show you why 3 day routines are excellent muscle builders with scientific evidences, and show you how even experienced bodybuilders are benefitting from 3 day, intense workouts. Can you build muscles training only 3 days per week? Absolutely. And I even recommend it for beginner hardgainers because I believe that it is the fastest way to build muscle mass if done right. If you got only 3 days per week, then 3 day plan might be your only option but it has other advantages too. You need 24 to 48 hours for your nervous system and muscles to recover from your brutal workout. I mentioned nervous system first because using high loads, which is a crucial requirement for muscle growth, drains the nervous system. You lose important neurotransmitters which get used up during neural firing of your muscles in those high intensity workouts. Secondly your muscles need to repair and grow. If you remember the training effect principle, you grow after your workout IF you provide enough quality nutrients and recovery time. So 3 days a week workout done on alternate days is excellent for muscle building. It simply allows time for perfect recovery so that you hit the gym refreshed and ready for another high intensity workout. In a busy society like ours with school/work pressure, it gets difficult to go to the gym or workout at home everyday. The 3 day workouts are great at saving time. You can work extra on non-workout days and create time for next day workouts. I love the fact that 3 days workouts allow you to do cardio during rest from weight training. I just jog around, do interval training or an outdoor activity on non-workout days. This is called active rest and such low intensity activities are proven to stimulate even more muscle growth than passive resting on the couch. Missed a day? Just train the next. 3 day workouts gives you the freedom you need in case of missed workouts. They don’t throw the whole week plan off. Its very easy to get back on the training horse. If you train with low intensity, have plenty of time to train or are an advanced bodybuilder then you need higher frequency workouts as your body can adapt well to more workouts. Also called whole body training, in this workout you train every single muscle group in every workout, thrice a week. Since you train for 11 major muscle groups every workout, you need to train them with fewer exercises and sets. Below are 2 total body workouts that are equally effective as they target all major muscle groups. Workout 1 and 2 use alternative exercises for same muscle groups to avoid bring workouts. In this workout you will be doing both upper and lower body exercises for different body parts in every workout but without overlapping. Since you train different body parts, its called split training. Since you alternate push and pull exercises in same workout I call them Same day push pull workouts. Day Three: Upper Body Push, upper body pull, Biceps and Squats. Push and Pull are vertical ones. So basically you are workout each body part once every 5 days OR thrice in 2 weeks which is excellent for muscle gains and hypertrophy. This also ensures your entire body is worked upon every single workout and research has proven the anabolic hormones peak with such total body workouts. All this means more Maximum Muscle in Minimum Time. How to use: Perform Workout one on monday followed by workout two on Wednesday. Workout Two now falls on Monday again. The first two workouts use only exercise per body part. The next two workouts use two exercises for some body parts. They are higher volume and excellent for intermediate bodybuilders who can tolerate higher volume workouts. Excellent for advanced bodybuilders who can devote only 3 days per week. Train with high intensity, moderate volume and muscle gains are yours. Even the best workouts in the world will be worth nothing if nutrition is not taken care of. Provide first class proteins and simple carbohydrates immediately after workouts to jumpstart protein synthesis and repair. Provide first class proteins, complex carbs and essential fats throughout the day to maintain anabolic environment which is a must for muscle repair and growth. Learn more about eating in the Muscle building nutrition section. If you are an skinny hardgainer, then get the 26 week No Nonsense Muscle Building Program for fastest muscle transformation. Its the best program there is bar none. Short on Time?How about MI40 Program. MI40 is an abbreviated 40 day muscle building program designed to get you double the muscle in half the time. Its spurt-effective and the best program to learn training strategies for faster muscle gains. Is nutrition you biggest stumbling block? 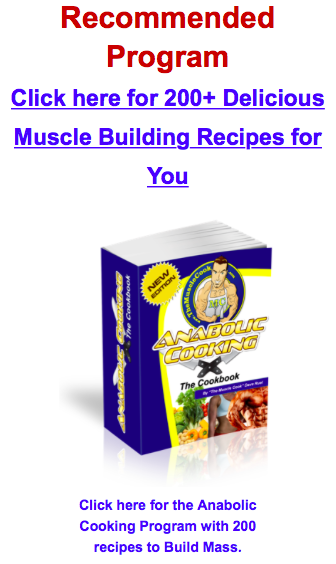 Then try Anabolic Cooking program and learn 200+ easy, tasty and convenient muscle building recipes for breakfast, lunch dinners, including snacks and muscle building shakes.